Have you been watching all of the commercials that are popular this time of year trying to get you to invest in something with all of them promising amazing results? Your weight loss, your health, your muscular body, your financial portfolio, training for your dream career etc. etc. While an investment in these things can be good and beneficial, I'd like to propose another investment that I'm pretty sure will yield greater dividends than all of the above items combined....Investing in People! Maybe this is the year you make a financial and time investment to go on a missions trip. Or perhaps you make a time investment to talk to that neighbor who seems a little lonely. Or you finally look into that local ministry that's always intrigued you and begin the investment of volunteering with them on a regular basis. Or you decide to invest in truly getting to know what makes that family member (who tends to get on your nerves) tick and then bless them with your unconditional love. Or maybe you just make the investment of being nicer to every. single. stranger you come into contact with this year. Whatever the investment, it will NOT come back as a negative balance even if you don't get to actually see or hear about the positive results. Oh sure, people are complicated and at times our investments seem to be yielding no positive returns. But that's when we have to make the hardest decision in this whole "investing in people" thing...the decision to NOT go into it thinking how it will profit us...but only how it will eventually profit them. Jesus did this while He was walking on earth and not only did He rarely get to see the "fruit" of his investment while here, he was more times than not, misunderstood, ridiculed, and mistreated. I feel compelled to write this letter to you in your time of grief to let you know I also feel your loss. The man Glenn Paul was paramount in my spiritual growth and in my life. I’m an inmate in prison and Glenn was my mentor. Through all my trials and tribulations he would be there for me as a friend or a father would do. I would discuss my family to him and he would beam about his wife and four daughters he loved so much. I believe he just came from a gathering at one of you girls’ house a few months prior. Why I am reminiscing on these minor details I don’t know. Maybe it’s because I valued every moment I had with him so much. And he truly touched my life even if it was for only 1 day out of the week. But oh how much I looked forward to seeing him that day. How he would challenge me spiritually. He was a blessing for me from God and helped fulfill my spiritual appetite. He helped me learn how to break down the Word better. He helped me in so many ways. He’s the primary reason people see a change in me today. My eyes are becoming teary as I think about my good friend Glenn. I’m so sad he’s gone. There was so much more I could have learned from him as I told the chaplain. He also said to me about the lives Glenn affected up here at the prison. It was truly amazing how spiritually gifted he was. Also how loving. I work on a work release which me and him prayed about together and God granted me a job. And like a father checking on his son he came to see me at work and check to see how I was doing. Unfortunately, I had off that day, but they told me they gave him a glowing report. The sad part is that would have been the last time for me to see him. Though I wish I could see him just one last time just to tell him thanks and that I love him. He was a truly great God fearing man. And I truly do feel your loss and send my condolences. So, certainly invest in those areas that will help you live 2014 with better health and balance so that you can ultimately make the life-changing investment in someone else. Remembering the True Gift that continues to give to ALL who will receive! Catch the cow in the morning and she's a happy cow. Time for trick-or-treating and happy cow is now sleepy cow trying to get to her sleepy cow happy place. Quick photo op! Sleepy cow smiled! Ready to be put out to pasture for the night. Wait a minute. There's life in this little cow yet! So yeah. This is how photo shoots of the kids go when the little cow is all moo-ed out. "Soon I'm going to have to start my mad cow imitation or she's never going to leave me alone." Nadia's 3yr. "Gotcha Day" anniversary was this past Tuesday, June 17, 2013! Woo Hoo! It got me thinking of all the things having Nadia has taught me and our family the last three years. When we first met her, the only information we had about Nadia was that she was "quiet and healthy." 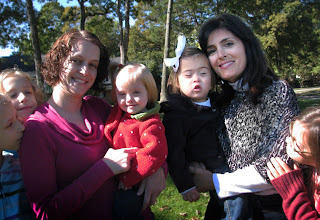 We also had our experience with our other daughter with Down syndrome which gave us a sense that we "knew" about Nadia even before we met her. 1. Children sharing the same label or disability can be as different as night and day. While Josi is somewhat reserved and quiet in new situations... Nadia is wide open and raring to go. 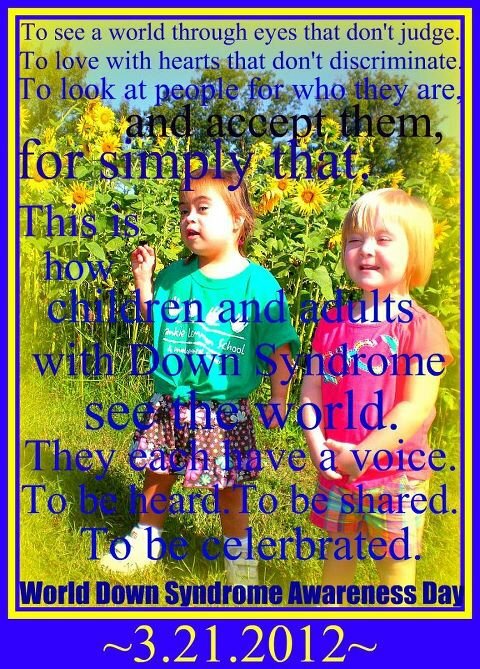 Bottom line: Please don't make the mistake of grouping people with Down syndrome(or any disability) into the same category by saying things like, "Oh, they're all so loving." or "They are never in bad moods" because like all people, they have unique, God-given temperaments and personalities that make them one-of-a-kind...like the 'rest' of us. One of the things that initially drove me nuts was getting Nadia all dressed to go somewhere and have her remove her shoes and hair bows as soon as I pulled out of the driveway. I even bought lace-up hi-tops in hopes that she wouldn't be able to remove those...wrong. If the girl can figure out how to remove the slats from under her mattress then she can certainly remove any type of shoe known to man. So, after much scolding and gnashing of teeth (MINE), I decided this was not a battle to have with a smart, strong-willed preschooler. So, I'm driving back to NC from PA and we stopped at a busy rest area in Maryland. I took both girls into the bathroom with me and had Nadia go potty first. After getting her taken care of, I assisted Josi in making sure her pad was on right for the long car ride. It's finally my turn and as I am in mid-pee, Nadia decides to jail break the door and make a run for it. I yelled for Josi to go capture the little escapee as I finished my business with the door wide open. This kind of thing used to make me want to cry and complain about how hard my life is, but honestly, after 3yrs. of some of the hardest parenting moments I've ever known, my best response is to just LAUGH! It really is funny and everyone I've told this story to has laughed out loud...so laughing is apparently the appropriate response to these situations....because the alternative is depressing and draining. I've also been brought to a place of realizing that I'm not equipped to do this parenting thing without my Heavenly Father--the perfect parent. Nadia has been a complete puzzle in a lot of areas as we CONTINUE to try to figure out what causes certain behaviors, why she isn't talking when we know she's very smart, why she doesn't sleep very well, etc. I could drive myself nuts trying to figure these things out or worse try to "fix" them. I have learned that true contentment can only come with complete trust in God and in accepting the situations He's allowing and knowing that He's got it figured out...and when it's time...I will too. I spent the first year or so trying to turn Nadia into something she wasn't...not accepting her for who she was because who she was, wasn't developing "fast" enough to make life easier for me. I'm not proud of that statement but it's the truth. Nadia has about 15 words and numerous signs but she will only use them if you ask her to repeat you. However, there are very few situations where we can't figure out what she wants or needs. Would it be easier if she were communicating by talking now? Sure. I used to think the 'talking' aspect of a child's development was a necessary benchmark to gauge her intelligence level. Having Nadia has taught me to emphasize what is truly important vs. what culture deems important. She can let us know what she needs and she knows that we are going to meet her needs, which is way more important (especially to a former orphan) than correct pronunciation or how many words she has at a certain age. Learning to "chill" in this area has been huge for me and I'm thankful for the change in my paradigm that raising Nadia has allowed. When we first received Nadia's file in Ukraine, we were told she was born with an open oval window in her heart. This was a little bit of a surprise but in no means a "deal breaker". Thankfully, it had closed on its own and she hasn't had any major medical issues since we're home, but she's certainly had her fair share of doctor and hospital visits over the last 3yrs. which is something I initially dreaded because of my experiences with Josi in this area. Nadia on the other hand enters all appointments and hospital visits like she enters most other situations. "Who can I hug?" "What can I knock over and destroy?" "Will there be snacks?" No child, no matter how difficult they may be to parent, deserves to live out their life in a mental institution (which is where Nadia would probably be by now). As I watch the waiting children on Reece's Rainbow and see how many are facing transfer to a mental institution because they've aged out of the "Baby House", or those getting ready to turn 16 and AGE OUT of the system for good, only to be given a few dollars and cast out into the streets, I can't help but wonder who will be the ones to step out of their parenting comfort zone and take in what could be a difficult child to parent? Are there days when I wish I could rewind our family's life to 3yrs. ago? I'd be lying if I said the thought never crosses my mind. But the thought that pervades my thinking more often is how much our lives have changed for the better because of adopting Nadia. I met my good friend, Jenn, when we were both adopting our girls from Ukraine. We happened to have the same social worker and so when she mentioned to me that another family was adopting from Ukraine and that they lived 4 blocks away, I was so excited! 3yrs. later, we are still good friends as we share in the ups and downs of loving these Ukrainian sweethearts as they adjust to life outside of an institution. 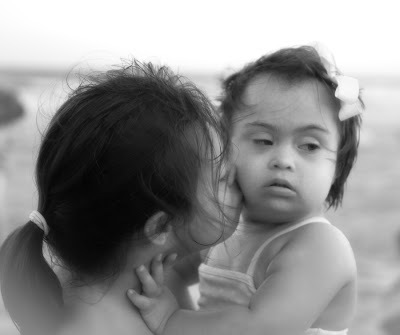 Jenn and her husband have decided to add 2 more precious babes rockin' that extra chromosome to their family!!! Look at these 2 cuties! On the left is Riley and on the right is Danny. 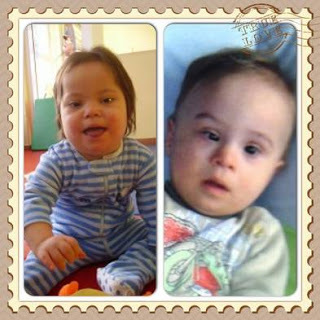 This time they are heading to a different country, and just like last time, it will take thousands and thousands of dollars to complete their international adoption. So here's where YOU get to participate in God's call on ALL our lives to minister to the orphan. So, hop on over to Jenn's blog and put in your donation entries. 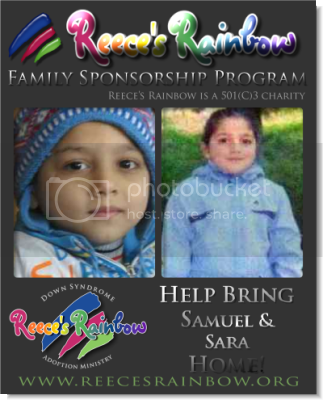 Don't wait, don't put it off, you're just a few clicks away from making a difference in the lives of 2 orphans who desperately need to be in a family--so go for it!!! And THANK YOU!! !